My fair-isle shawl is getting bigger and bigger. I’m still totally infatuated with it. I love it to pieces! 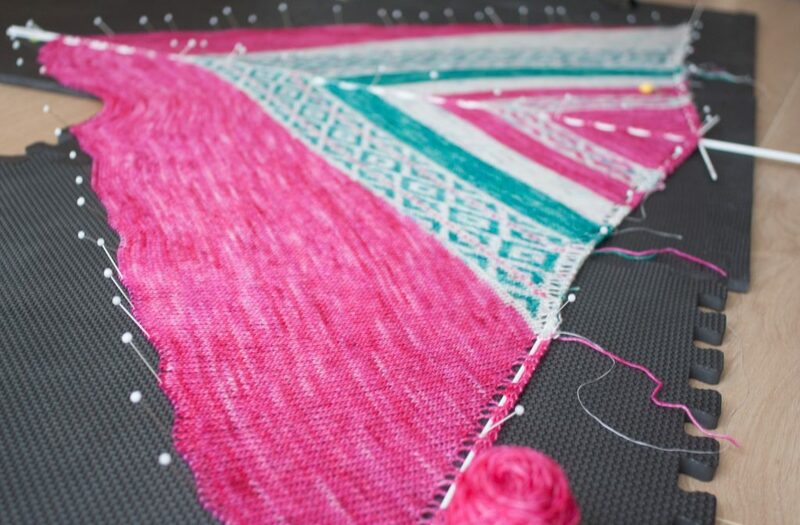 Knitted with single yarns, two-colours fair-isle, stocking stitch short rows and soon a lace border, it’s me in a shawl from the first to the last stitch. I’m having quite a hard to find him a good name, any thoughts on this topic is very welcomed! The pink is actually straight, not with this weird bump next to the center… Next time, I’ll try to think to check that the shawl on the mat BEFORE pinning! 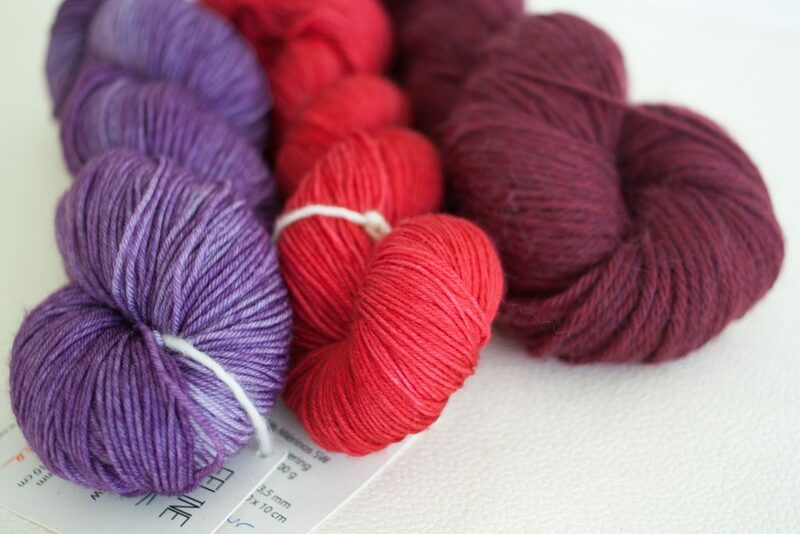 I went to Le Chat qui Tricote at the end of the month to teach some knitting classes (more on this below) and took the opportunity to bring home some beautiful Féline skeins to work on new collaborations. This is one of my go-to yarn, especially if I’m looking for a plied one. Super soft and rich colours, perfect to enhance some lace patterns or let the magic happening in simple garter or stocking stitch. In addition to these two thin yarn, I treated myself with some gorgeous Herriot from Juniper Moon Farm. It’s my first real (understand paid) addition to my stash since ages. To adress the elephant in the room, it’s no cheap yarn. But it deserve it. I think it’s one of the softest yarn I ever touched and definitively the softest alpaca. I already knitted a hat with it two years ago. I wore it A LOT and it bore it like a dream. I plan to transform this one into mittens and publish both the hat and mitten patterns this Fall / Winter. I’ve also a new shawl pattern going live tomorrow! 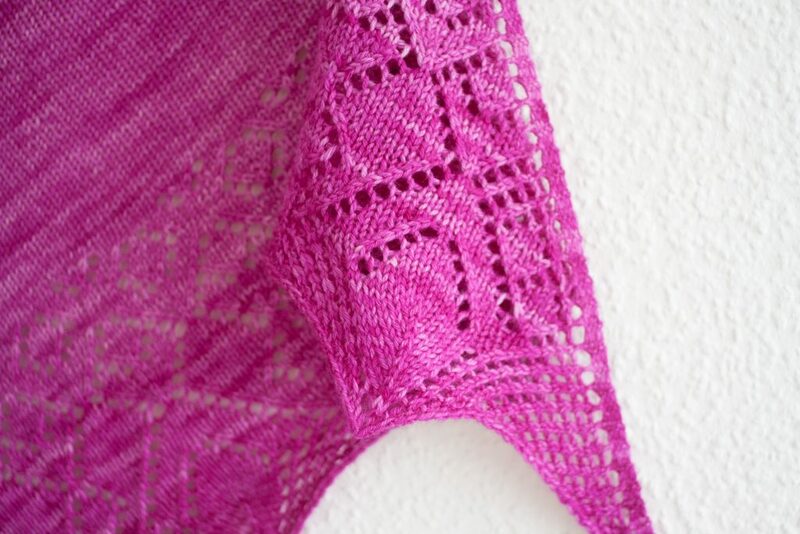 The Anjali shawl pattern is a easy and quick shawl with a stocking stitch body and a lace border. More on this subject on the blog Sunday morning! Once again, I’ve partnered with Le Chat qui Tricote and with have some great treats for you in the pipeline (hint: it starts with a “B” and ends with “ox”). Speaking of Le Chat qui Tricote, I taught three classes there this month: Shawls level 2 (cables and Estonian lace), Toe-up Socks and Socks Tips and Tricks (afterthought heels, two-at-a-time on magic loop, etc.). I will be going there again at the end of September but we did not yet fixed the class topics. What topics would you want me to talk about? I originally planned a big marker update this month (among others: sheep, cows, and rabbits paired with flowers) but my material restock order is stuck in the manufacturer making pipeline… Ugh! Hopefully it will be here in July. So many thing to craft and write right now! July and it’s long day is ideal to craft, especially if the weather go easy on us and avoid dramatic hot temperatures. On the personal side, I would very much finish my patchwork stole, work on that cute cross-stitch sampler and get all my EPP sewed together to finish the outside of my laptop cover. Finish and write my Not-named-yet Fair-Isle shawl. Hmm.. that’s ambitious but let’s see how it goes. Work on the Hanging Gardens collection: Write my Hanging Gardens Cowl. Knit and write the first (out of two) Hanging Gardens Hat. 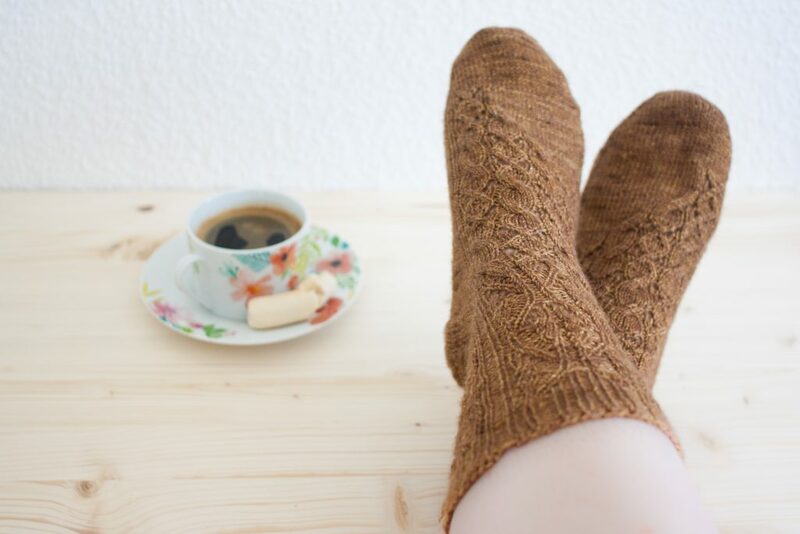 Write six new sock patterns for an upcoming collection (I’m writing a book!). And knit one of them. What’s your plan for July? What do you like to craft during the summer?